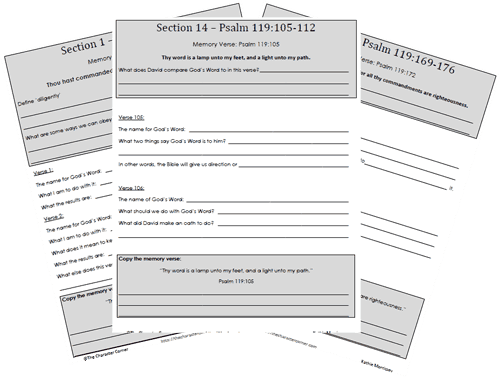 This study of Psalm 119 has 118 pages, and is a 22-week study intended for grades 4-12. It will encourage your kids to love God’s Word, as well as learn the results and blessings that come from knowing and keeping His Word. Psalm 119 is a Psalm that glorifies God and His Word. Out of 176 verses, there are only five that don’t refer to the Word of God. 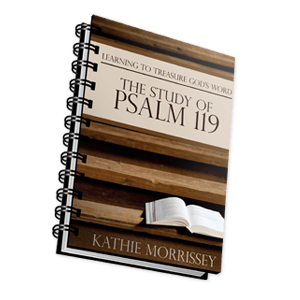 This study of Psalm 119 is intended for grades 4-12, will encourage your kids to love God’s Word, as well as learn the results and blessings that come from knowing and keeping His Word. This ebook has 118 pages, and is a 22-week study. Instructions and lesson plans are included, so your student knows what to do daily. Parents can also use this as a family Bible study or devotional, or if you desire to use it with younger children, you can work through it with them. 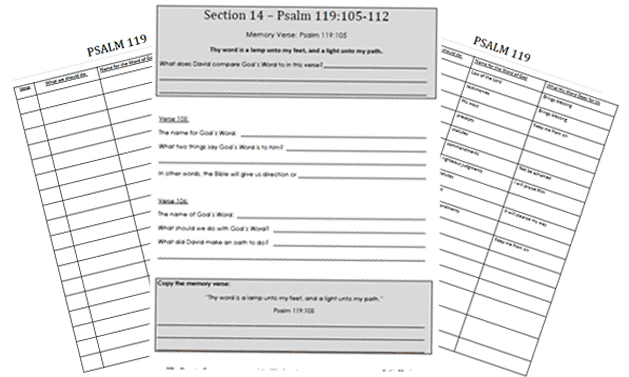 Each week the lessons will include reading a section of Psalm, highlighting words in that section, then doing workbook pages for the section, memorizing a verse, and filling in a chart. The chart shows names used for God’s Word, what we are to do with it, and what the results or benefits are. Lessons will take about 10 minutes a day. This is a very simple, easy- to- incorporate method of giving your kids a love for God’s Word! One for All Versions, with only references given, so you can choose the version of your choice. One written from the King James Version with text and verses for memory written out and included.